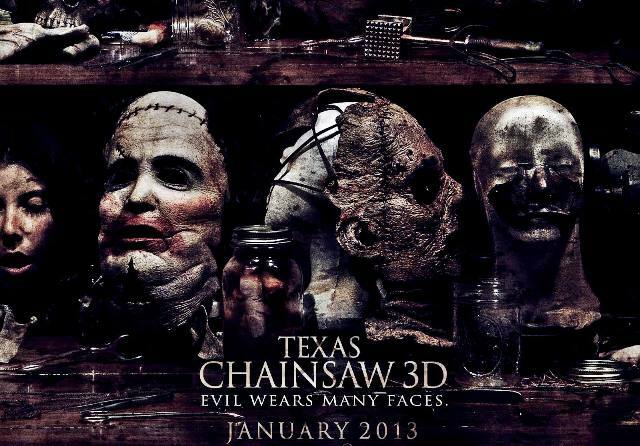 “Texas Chainsaw Massacre 3D”…One Face-lift Too Many! 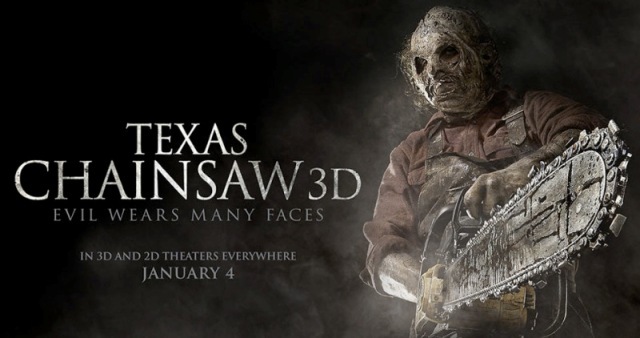 I just returned from seeing 2013’s first theatrical offering THE TEXAS CHAINSAW MASSACRE 3D! Many horror fans will site the original as a masterpiece and Bubba a.k.a. Leatherface remains a fan favorite. It’s understandable and there is NO question that the 1974 original was a disconcerting masterpiece with the chainsaw wielding, Leatherface, one of cinema’s most gruesome and iconic killers! Since that time there have been many more incantations of the character in various sequels, prequels, and remakes leading up to this latest feature. This being a direct sequel to the original (dismissing all other sequels) and opening up in theaters this past Friday. The word “sequel” is definitely not to be taken lightly here as it takes place immediately after the first, featuring a police man investigating what Marilyn Burn’s character (Sally) obviously reported upon reaching safety. The cop demands that the homicidal family give up their simple-minded, marauding kin, Leatherface, and they are just about to when a posse of locals arrive and decide to take matters into their own hands. As the long arm of the law looks on in horror, the family is riddled with bullets and their home reduced to a fiery cinder. Amid the chaos, a woman and her child manage to escape before being caught by a country bumpkin who finishes the mother off before claiming her daughter (whom they name Heather) as his own. She gets raised by he and his barren wife in conditions not much better than where they’d taken her from. Flash forward 40 years (or more like 20 as the girl seems considerably less older than 40) and she’s all grown up and working in the meat department of her local grocery store. I guess this proves that you can take the gal out of the slaughterhouse but you can’t take the slaughterhouse out of the gal! After learning she received an inheritance from a grandmother she never knew she’d, Heather grabs her boyfriend and a few pals (victims) along for a trip to Texas to discover her spoils. Despite the crappy conditions her kinfolk lived in during the first film, there must have been some cash growing on that family tree as she finds herself the proud owner of a beautiful mansion complete with wine cellar, pool table, and all the comforts of a well kept plantation. Actually it features a bit more than she bargained for as, in the basement, lives Leatherface; kept alive and well by grandma for the past several decades. All of this was supposedly revealed in a letter from her grandmother but, having not bothered to read it, is discovered the hard was as her friends start to getting killed off and she finds herself at the wrong end of chainsaw chase. The movie does give fresh blood to the franchise and the years have done little to suppress Leatherface’s killing drive. One of the vigilante locals became mayor of the town and is interested in cutting off any loose ends. He’s unlikeable and has family members that succumb to his diabolical wishes not unlike his quarry. This brings viewers to the ultimate dilemma; just who IS the real villain here? Like a lot of horror films, many scenes will leave you scratching your head and, other than having some previous actors such as the aforementioned Marilyn Burns and Gunnar Hanson make cameos, is in no way able to stand up to the original. The 3D aspect provides some notable moments such as a POV shot of a chainsaw cutting through a casket but, aside from that, the film would be equally entertaining in a 2D format and certainly worth a rent if not a trip to the local theater. All in all, the film is entertaining (if not predictable) and definitely proves that everyone can use a face-lift every now and then…even if the leather variety! This entry was posted in Horror, Movie Reviews, Slasher Movies and tagged Leatherface, TEXAS CHAINSAW MASSACRE 3D. Bookmark the permalink. ← “Godzilla Vs. Biollante” on Blu-Ray!!! wasn’t a retread. Second time especially the projection was very bright & sitting in the up front gimp seats was trying to avoid the blade during the casket season. Fine job all around & if I had the money would make me want to get a 3-D set. Just wish they could have worked in a small photo to Jim Siedow. Since TCM3-D was first at the box office it makes me wish whoever owns the Cannon rights would find all the missing bits & New Line re-released TCM 3 in the uber nasty ‘work print’ as an extra on a Blu-Ray of the theatrical cut since they supposedly just cut the scenes out of the negative. The saw is still family and this new different concept was pure joy.